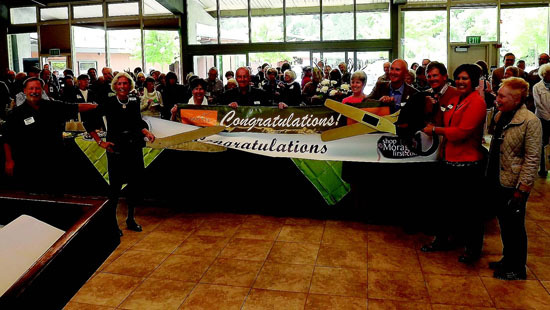 A crowd of over 200 "over 55" adults attended grand opening ceremonies for Lamorinda Village April 6 at Lafayette-Orinda Presbyterian Church, where its new office space, donated by LOPC, is located. "They've done a great job organizing this [event]," said vendor Bill Kammerer of Always the Best Care. But Lamorinda Village is not a place; it's a program. Specifically, it's a community-based nonprofit member-driven organization, modeled on Beacon Hill Village in Boston, Mass., that provides programs and services for members to help them continue to live active lives in their own homes and neighborhoods. The Lamorinda branch was three years in the making and is now under the direction of its newly appointed executive director, Anne Ornelas. Lamorinda Village received a start-up grant of $43,215 in December from the Joseph and Vera Long Foundation. It is also working with local health care providers to bridge the gap between hospital discharge and home care. "We're so excited to launch this nationally acclaimed concept," said Lamorinda Village board of directors president Ruth McCahan, adding, "It's a great value to the community." As of April 8, Outreach Chair Andy Amstutz said there were 102 members, 55 volunteers, and 68 donors, with some members also serving as volunteers. Although the minimum age for membership is 55, Ornelas stressed, "age doesn't matter" when it comes to volunteering. "We want high school students, college students and stay at home moms," she said. And while Ornelas is pleased that the current roster includes a good many volunteers, she hopes to enlist two or three times that number and grow its membership, following in the footsteps of Berkeley's Ashby Village. Lamorinda Village intends to provide members both the practical means and the confidence to remain in their homes as they age, said Amstutz. "The Village doesn't compete with other services and programs for older adults; we partner with them and help you access them," he wrote in a welcome letter. "This extends the time people can stay in their own home," explained board member Karen Mendonca, who is intent on promoting the organization's member survey. She was pleased with the event's positive turnout. Ellen Peterson did not attend the ribbon cutting but gathered neighbors and friends for an informational meeting at her house in February. Peterson knows firsthand how the village model works. Her brother Thomas Reese was active in the formation of Palo Alto's Avenidas Village 10 years ago. Peterson enrolled in Lamorinda Village primarily to "pay it forward" for now. "It's a good place to do some volunteer hours," she said. Although she doubts her neighbors will join "until they're older or single," Peterson expects Lamorinda Village to be extremely successful. "Seniors and baby boomers will live a long time and need help," she said, adding praise for the founding board members and its president. "I trust them." There are currently more than 140 active villages throughout the United States, including four others in the Bay Area - in Palo Alto, San Francisco, Oakland and Berkeley. Plans for two additional villages in Clayton and Walnut Creek are also in the works. Annual fees range from $300 for a single person annual social membership to $1,200 for a two-person household full membership. The social membership entitles members to access a list of pre-screened professional services at a discount and join social and educational activities. Full members also have access to volunteer help with local transportation, household maintenance or assistance during medical appointments. 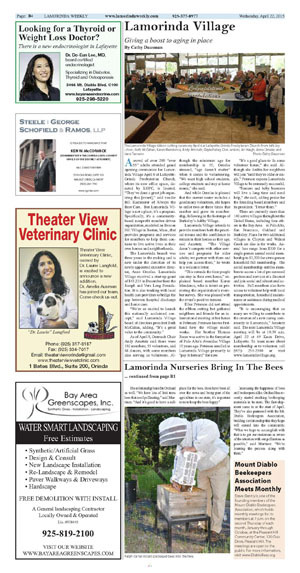 "It is encouraging that so many are willing to contribute in the creation of a new caring community in Lamorinda," Amstutz said. The next Lamorinda Village meeting will be at 10:30 a.m. April 22 at 49 Knox Drive, Lafayette. To learn more about membership or to volunteer, call (925) 253-2300 or visit www.lamorindavillage.org.